Dr. Bill Bass and Jon Jefferson, who together comprise the writing team of Jefferson Bass, are here today to answer questions. 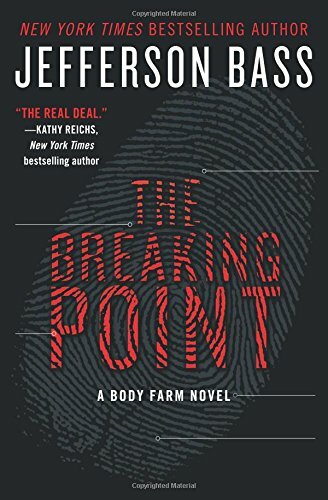 Dr. Bass runs the real life Body Farm that serves as the basis of their books. You can read our review of their most recent book here. - Do you use real cases from the real-life Body Farm in your books? How do you know when a case will make a good story? Absolutely, although they're fictionalized to a greater or lesser extent. Our 2013 novel, CUT TO THE BONE, was very strongly inspired by the case of the "Zoo Man," Thomas Huskey, a former zoo employee who killed a series of Knoxville prostitutes in the early 1990s. Jon and I recounted the Zoo Man case in our nonfiction book DEATH'S ACRE in 2003; a decade later, we explored a parallel-universe, fictionalized version of the case in deeper, darker detail. Our new novel, THE BREAKING POINT, draws on several aviation crashes I've worked over the years, with details from a few other cases thrown in for good measure. What makes a case a good story? It's the same in real life and in fiction: compelling characters, dramatic action, often some sort of bigger issue (violence against women, for instance, or abuse of children), and of course plenty of forensic twists and turns! - Where did you get the idea for the real-life Body Farm? In 1971 I moved to Knoxville to head the Anthropology Department at UT. When I did, the Tennessee state medical examiner—who knew me slightly—asked if I would be willing to serve as the state’s forensic anthropologist, helping law-enforcement agengies identify bodies. What I didn’t foresee, when I said “yes,” was the dramatic difference between Tennessee murder victims and Kansas murder victims. In Kansas, when police asked me to help identify someone, they generally brought me a box of dry bones; sometimes there would be bits of mummified tissue clinging to the bone, but for the most part, my cases in Kansas—a big, sparsely populated, relatively dry region—involved skeletal remains. In Tennessee, on the other hand—half as big, twice as many people, and several times as much rainfall—the victims tended to be fresher, smellier, and infinitely buggier, swarming with maggots, the wormlike larvae of blowflies. And when a Tennessee police officer or district attorney would ask me how long one of these corpses had been ripening, I had no solid scientific basis for an answer. So I decided to remedy that gap in my own knowledge. In 1980, on a couple of acres of junk land behind the University of Tennessee Medical Center—a patch of scraggly woods with a charred open area at the center, where the hospital had burned trash for years—I poured a concrete pad measuring 16 feet square; atop this pad, I built a chainlink enclosure, complete with a chainlink “roof.” I planned to place, inside the fence and safe from predators (except for predators small enough to slip through the weave of the wire), human bodies, which my graduate students and I would observe closely, recording the sequence and the timing of human decomposition during the extended postmortem interval. - How did you start working together? How did you meet? We met in 1999 or 2000 - the exact date is lost in the mists of time! - when I (Jon) was a television documentary writer and producer. I've always been fascinated by science - when I was in high school, I ground and polished my own telescope mirror, and during my twenties and thirties, I worked as a science writer at Oak Ridge National Laboratory. In casting about for interesting science documentary topics, I decided to call the legendary Bill Bass, creator of the Body Farm, and ask if I could bring a camera crew to document the decay of a donated body from start to finish. He liked the idea, and the resulting documentary - "Biography of a Corpse" - was seen by millions of National Geographic viewers around the world. Somewhere along the way, Bill asked if I'd be willing to work with him on a memoir, and, well, one thing led to another, and another, and another! - What is the best thing that has happened to you as a result of your novels? On the personal level, we've had a great time working together, and we've met many lovely people at book signings and presentations over the past twelve (!) years. Taking a broader perspective, one of the great things to come out of our 2011 novel, THE BONE YARD - which was inspired by the real-life story of a horrific "reform" school in Florida - is that we helped raise awareness of the school's terrible abuses. Shortly after the novel was published, the state closed the school. Even more significantly, not long after that, a forensic team from the University of South Florida began investigating the dozens of deaths that occurred at the school over the decades. School records had indicated that 29 boys and 2 adults were buried in the school's cemetery, but the forensic team found 55 graves. It's a fascinating case of fact inspiring fiction, and fiction, in turn, catalyzing real-life investigation.